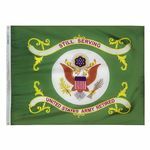 A green flag in the center is the Army seal, above a scroll bearing the words "STILL SERVING" and below a scroll bearing the words "UNITED STATES ARMY RETIRED". The Chief of Staff, Army Retiree Council met on 23-27 March 1992. The Council was briefed by members of the Army Staff on various matters one being the design of a flag for Army Retirees. 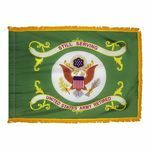 The Institute of Heraldry was requested to provide flag designs and one of those designs was selected by the Chief of Staff, Army Retiree Council to become the official flag for U.S. Army Retirees on 16 April 1993.